I often am asked by people how to make life simple. People want to simplify their life, but why do they insist on cluttering the process? Life is simple, we make it complicated and believe it or not, we complicate it over the human concept of love. I say the human concept because we tend to put more into the meaning of the word than what it really is. Love is said to be a variety of different feelings, states, and attitudes that ranges from interpersonal affection (“I love my mother”) to pleasure (“I loved that meal”). It can refer to an emotion of a strong attraction and personal attachment. It can also be a virtue representing human kindness, compassion, and affection—”the unselfish loyal and benevolent concern for the good of another”. It may also describe compassionate and affectionate actions towards other humans, one’s self or animals. The Christian understanding is that love comes from God. The love of man and woman—eros in Greek—and the unselfish love of others (agape), are often contrasted as “ascending” and “descending” love, respectively, but are ultimately the same thing. Christian theologians see God as the source of love, which is mirrored in humans and their own loving relationships. These are all human interpretations of love and for the most part they overlook the simplicity of the word love. Because of this we need to loosen our grasp on these feelings. Love is more than a feeling, it is also a choice. When was the last time you sat out in your backyard at night and looked into the heavens? When was the last time you let your eyes take in the beauty of the flowers, trees, the birds and the bees, and all the creatures that God has created? In Genesis 1, the book of beginning, God created it all and it was good. It was love and it still is. God is love and we are created with this love. When you realize that everything you see, taste, smell, and feel is love then you will start to see the simplicity of it and of life. When life gets so cluttered with things and noise and silly unnecessary activities, it is then when you have to realize the love in all this. These things are all part of life, not complications of life and not mere distractions, so you can’t use them as excuses to say you can’t live a simple life. As a parent, husband or wife, a friend and neighbor we all have little things that seem to get in the way of our perceived goals in life. God puts these little things in our path to remind us that He create us with love and we need to do all things with the same love. This is what makes living a simple life easy. When you can walk up to a friend or neighbor and say I love you and mean it, then you are on the right path. Grandfather once told me a story about a great man that walked the earth. This man could do anything, heal people, talk to the animals and have them do as he asked, and clear the heavens of stormy clouds with a wave of his hand. Grandfather was so enamored over this man that he invited him to have dinner with us one evening. He hurried home to make the best dinner he could and had us all clean up for our special guest. We waited until late when there was knock on the door, when he opened the door there was a beggar there looking for something to eat so Grandfather fed him and sent him on his way. A little later there was a knock on the door and when Grandfather opened it there was a poor lady wondering if we had any clothing she could have to stay warm. Grandfather gave her warm clothes and blankets. A little later a young man came with a bad cut on his arm, which Grandfather treated and bandaged. The great man never showed until the next morning. Grandfather asked why he was so late and the man said when I was hungry you gave me food, when I was cold you clothed me and gave me blankets and when I was hurt you treated my wounds so how can you say I am late. Grandfather tells this story because, as he said, you never know who you are helping and it is always best to give your all when helping a neighbor of stranger in need. When I was growing up my Grandfather told me several times I was given a choice on what to do and I made that choice. I don’t think I ever realized what he was saying until several years after he passed. God gave us free will, the power to choose, and we are all responsible for the choices we make in life. The power to choose! Do you realize how powerful that is? We are given information, determine what is best for us and make a choice, it’s that simple. Or is it? Taking a closer look, I realized that it is not what is best for us, it is what is best for the Glory of God. We’ve been starring it in the face all our life and still get it wrong. God has reminded us many times, but we have been too bullheaded to see it. I don’t answer for you, you don’t answer for me, we are all responsible for the decisions we make. I choose to Love! What do you choose? The Christian Church is a house divided against itself and this division could just tear what is left of the Church apart. Now that I have your attention let’s discuss it. Christian’s believe that the Bible is God’s word and that Jesus is the only way to eternal life. All Christians believe this, yet because of disagreements over this or that, the Church has divided into denominations. We have the Baptist, Methodist, United Church of Christ, Presbyterian and many, many more. They all believe the basic fundamentals of the Christian Church. The difference is some don’t look at your neighbors as including all neighbors, some look at contraceptives as against the will of God, some think you can baptize with a sprinkling of water, and the list goes on and on. In the Bible Jesus said love your neighbors as God has loved you, take care of the poor, needy and sick. What He didn’t say was choose those who follow what you believe and dump the rest. If we are to follow the Bible, we must follow all of it, not just the parts that make us feel good about ourselves. What the Christian Church needs is an interdenominational revival to settle their differences and it needs to happen real soon for God is only going to take this for so long before He sends a storm our way. We need churches to start holding services together and pastors going to other churches to preach. We need all Christians working together to build a stronger Church. It is the sound of the Christian Church failing that is waking up the unbelievers to overtake the Country. If we, as Christians want to save our Country, we need to unite and stand up as one group again. This is a Country founded on Christian beliefs, let’s all work together to unite it once again. A house divided against itself will fall! What do you think? Courteous comments always welcome. Are we doing some good? This post will complete the lessons from Grandfather, as he passed during the summer of my 12th year. To Take Care of Mother Earth and the other 3 colors of Man. To Respect this Mother Earth and Creation. To Honor All life, and to support that Honor. To be Grateful from the heart for All life. It is through life that there is Survival. Thank the Creator at All times for All life. To Love and express that love. To be Humble. Humility is the gift of wisdom and understanding. Kindness. To be Kind with one-self and with others. Sharing. The Sharing of feelings and personal concerns and commitments. Honesty. To be Honest with one-self and with others. children. Then he took me to the Medicine Wheel and we started meditating on each of them. This is where life starts to get a little deep, for all aspects of life and our relationship with God are connected with each other. In order to explain this we need to go back to the wheel. Another aspect of the Shaman Cosmology is the four sacred directions, or the four winds. These four sacred directions also correspond to the four natural elements (Earth, Water, Fire, Air), and depending on the tradition, tend to vary in their correlation. This has been called by some Earth astrology. The four directions are ways of connecting with the seasons of our lives, and understanding them greatly assists in coming into harmony with our own natural rhythms and patterns. It is a pattern of time cycles. Each direction typically has an animal, plant, or mineral that holds the energetic quality that corresponds to it, as well as different organ systems in the body. It also has a correlation to different cycles of time: day, year (season), and our entire life. One can meditate on these different seasons and cycles of time and come to greatly understand the energies of the directions. The wheel typically begins in the East, the place of the rising sun, the dawn of a new day and the spring time. It is all about newness, fresh starts, and the shining of light in places where there was once darkness. Illumination and inspiration all fall in the east, as does the element of air and the bird tribes (Eagle, Hawk, Condor). In the East, we are able to gain a distant perspective on our lives, to see far into the future and understand what the best direction we are to take. We see things in the light of a new day. The East relates to childhood, adolescence, and correlates to the archetype of the teacher. Next is the South: high noon, summertime, and the element of fire. It is here that we learn the art of celebration, innocence, and travel. We dance our dance, sing our song, and share our existence with others. In the East we have gained insight and understanding into our lives, in the South we share that understanding. It is here we learn the lessons of the heart: the full, clear, open and strong heart. Coyote lives there. The South relates to early adulthood and is correlated to the archetype of the visionary. The West correlates to the dusk, autumn, and the element of water. It is in this place that we begin our journey inward to reflect on the expansiveness and extroversion of the East and South. The West is the looking within place, and is a time for looking into the patterns we carry that must be let go of in order to become who we truly are. This is the lesson of the autumn trees who drop their leaves to nourish the Earth once again. Bear and Crow reside in the West, along with all of our ancestors. This is usually a time of great emotion, slowing down, and gathering ourselves for the winter ahead. The West relates to adulthood/middle age and correlates to the archetype of the healer. The final turn on the medicine wheel is the North: the night, winter, and the element of Earth. The North is the place of nothingness, where we return to the Great Mystery to receive our vision to be ignited in the East. It is a place of the three dreams: the day dream, the night dream and the life dream. This is the time where we are to dream deep and wide, for the vision of our life purpose and who we truly are. Deep ancient elders and wise ones live in the North, but we must be able to empty ourselves to receive their wisdom. It is the place of the Owl and other nocturnal animals. The North relates to elder-hood and correlates to the archetype of the warrior. By understanding the energetic architecture of the seasons, times of day, and times of our lives, we can better come into harmony with it and integrate the lessons life is bringing our way. It also helps to correlate things that are seemingly disparate, as everything has a place on the wheel and is thus related to everything else. So, by understanding where a plant resides on the medicine wheel, certain correlation’s can be drawn to animals, seasons, and states of consciousness and experiences that would otherwise not be able to be related. It is a simple map that can be ones teacher for life. I realize that this may raise a lot of questions in your mind, it did in mine when Grandfather first taught me, but he was there to answer them for me, for the most part. As I mentioned he passed over shortly after that. However, if you find yourself with unanswered questions, I will do my best to give you the answer. As Grandfather would tell me – The only stupid question is the one you didn’t ask. ” Just ask them in the reply section or e-mail them to me at efchristi2@yahoo.com. I carry these lessons in my heart and do meditate on them often. God has blessed me with good health, a strong mind and body. As the sacred instructions say, I am to pass these on to all nations. My name is Graywolf and my totem is the Dragonfly. In the Indian world these are very powerful symbols. 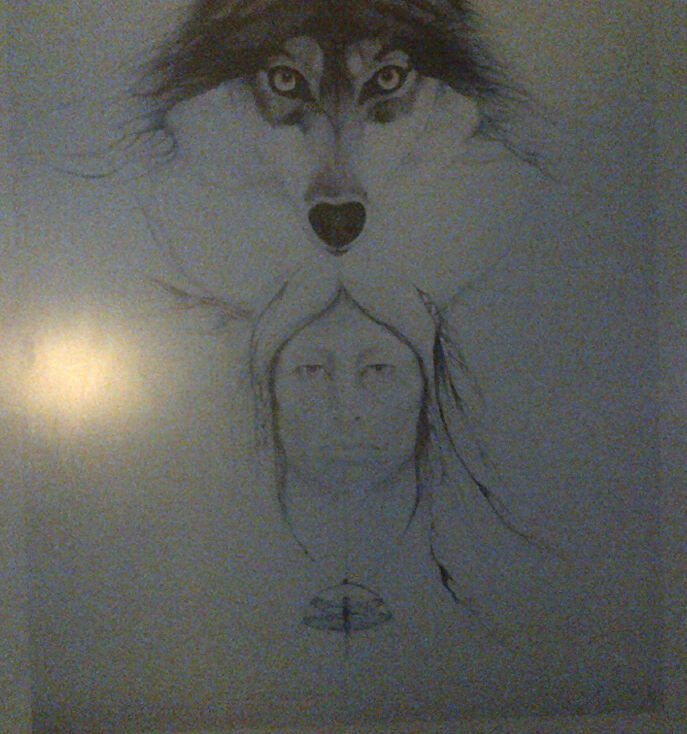 The Wolf is a powerful totem when you are feeling lost and do not know where to go… he guides you, he will be your protector as you make your journey on a new unexplored path, as you gain inner sight, wisdom, experience and confidence you will bond with Wolf becoming one of the pack, or he one of yours. But to venture into the forest means that you must be willing to face your own deepest fears. Wolf must venture deep into the forest to find what he requires for sustenance and growth, long ago he cast away his fear of the unknown. He has faced and conquered his deepest fears and now he walks the forest at night with supreme confidence, this trait bears powerful symbolic meaning if you choose to call upon the Wolf totem. The Dragonfly totem reveals how to get beyond illusions, dragonfly totem teaches the magic of shifting vibrations with the use of color and shows us the path to new worlds as she dances in and out of mystical portals. The Dragonfly totem leads you through the mists of change to the land of magic where you find your true power and your hear the wisdom of your soul. The Dragonfly spirit animal is a very powerful messenger of the delights of Magic! Dragonfly’s are full of mysticism, and powers of illusion and have a very deep insight on the true meaning of life. The Medicine Wheel, sometimes known as the Sacred Hoop, has been used by generations for health and healing. It embodies the Four Directions, as well as Father Sky, Mother Earth, and Spirit Tree—all of which symbolize dimensions of health and the cycles of life. All movement in the Medicine Wheel in ceremonies is circular, and typically in a clockwise, or “sun-wise” direction. This helps to align with the forces of Nature, such as gravity and the rising and setting of the Sun. Grandfather explained that our totems mix with the spirit world and teach us the healing ways and since my totems, the Wolf and the Dragonfly are fused within my life, I have a calming nature with a true insight on the spiritual meaning of life. I am a quick study with a uncanny gift of memory. As a child I never really gave it any thought, it was an interesting story, however as I grew up I found his words were very true. I can mix the spiritual world with the earthly world and see the deeper meaning as the result. He said I was to treat the Earth and all that dwell thereon with respect. Remain close to the Great Spirit. Show great respect for my fellow beings. Work together for the benefit of all Mankind. Give assistance and kindness wherever needed. As a healer, I pray for the healing of Mother Earth and for guidance in direction when dealing with the wants and needs of the people. Great Spirit, give us hearts to understand; never to take from creation’s beauty more than we give; never to destroy want only for the furtherance of greed; never to deny to give our hands for the building of earth’s beauty; never to take from her what we cannot use. As you can see, life on a reservation is, for lack of a better word, interesting. My education from both the AYOP school and my Grandfather has given me a very diverse life. I can say, as I reflect back on my early years, they have formed my life much deeper than I realized. I am, by the grace of God, very blessed. I hope this gives you some insight to the why’s and where for’s of my being. As before, I am always happy to answer your questions so please feel free to ask them.